"120 Acre ranch well manicured. The Ranch has five total parcel numbers (120 Acres), 2 houses; Main House 2,600 remodeled in 2009, 2nd house 500 sq ft, Barn (60x80), Work Shop (38x45), 1 Acre pad with Views, 10 Pastures, plenty of staging areas and room for arenas. Wrought Iron gates at entry and plenty of room for Trucking business or Ranching business. 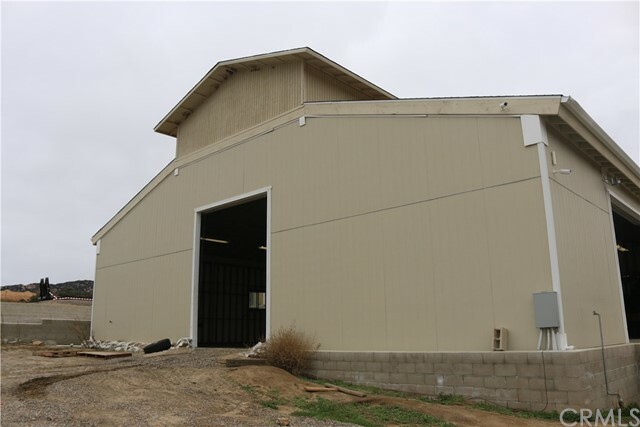 The ranch is approximately 9 miles from the Freeway and is very private!" "This property has an interesting history. In the 1930's it was a retreat for Hollywood actors, including popular Western star Randolph Scott. Its many brick and mortar structures have been home to over 100 world-class Arabian horses and currently is residence to over 30 gorgeous peacock birds. The energy here is rich and enchanting. This 15-acre slice of heaven sits peacefully in the heart of San Diego's mountain community of Alpine. It features 1 main house designed in Victorian style and 2 guest houses. Neighborhoods: Alpine Equipment: Shed(s) Other Fees: 0 Sewer: Septic Installed Topography: LL"
"Stunning, under 2 year old, custom home in the prestigious Rancho Palo Verde gated development with access to Private Lake. 4,804 sq ft single level home plus 1,500 sq ft garage and over 775 sq solid covered patio with 16 foot pocket door bringing the outside in. Ceilings range from 18 ft to 10 ft throughout, custom cabinetry, solid alder doors, base and crown. Fully automated Smart Home including full Home Theater, audio, lighting control, security and surveillance. 15.2 kw fully owned SOLAR! Neighborhoods: Rancho Palo Verde Architectural Style: Custom Built View: Custom Built Complex Features: ,,,,,,,,,, Equipment: Fire Sprinklers,Garage Door Opener, Water Filtration Other Fees: 0 Sewer: Septic Installed Topography: ,LL"
"Stunning panoramic views & an entertainers dream in the magnificent gated community of Rancho Palo Verde Estates. This home has nearly every amenity you could imagine including a gourmet kitchen, spa-like master bath with heated Travertine flooring, guest house, full outdoor kitchen & bar, gorgeous pool & waterfall, outdoor fireplace, sauna, mature trees & more. RPVE includes a private lake perfect for swimming, fishing, water sports, hiking & horse trails, clubhouse, gym, tennis courts & more. See Supp. Neighborhoods: Rancho Palo Verde Estates Complex Features: ,,,,,,,,,,,, Equipment: Garage Door Opener,Pool/Spa/Equipment, Range/Oven, Shed(s) Other Fees: 0 Sewer: Septic Installed Topography: SSLP Guest House Est. SQFT: 475"
"Your Dream Home & Lifestyle Await! Picture perfect Lake house in the desirable Palo Verde Ranch where you can enjoy boating, fishing, kayaking, swimming all from your own private boat dock complete with large deck, outdoor gazebo & kitchen perfect for entertaining or enjoying night skies by the fire pit. One of a kind single story with dual masters, completely upgraded with attached 1 BR guest apartment which includes kitchen, w/d & separate entrance. Gated, fully landscaped & a well for irrigation. Neighborhoods: Palo Verde Ranch Complex Features: ,,,,,, Equipment: Garage Door Opener, Range/Oven Other Fees: 0 Sewer: Septic Installed Topography: LL,GSL"
"Impressive & Awe-inspiring perched hilltop this magnificent home has panoramic views from every window & balcony to Coronado and the ocean. An entertainers dream, a kitchen designed for a chef, or quiet peaceful retreat this home is sure to please. Built w/detail, craftsmanship, dependability & fully upgraded throughout, A MUST SEE. Rancho Palo Verde is a gated community w/private lake perfect for swimming, fishing, kayaking; hiking & horse trails, a clubhouse, tennis courts & more. Neighborhoods: Rancho Palo Verde Equipment: Dryer,Fire Sprinklers,Garage Door Opener, Vacuum/Central, Washer, Water Filtration Other Fees: 0 Sewer: Septic Installed Topography: LL"
"Your private paradise awaits in the prestigious Rancho Palo Verde gated community. Gorgeous custom-built single story 5 Bed / 4 Bath home with 3,818 sq ft on 2 acres. This luxurious home has panoramic views of the surrounding hills. Amenities include granite counters in kitchen, stainless steel appliances, 2 fireplaces. Large covered patio features a granite bar with built in BBQ. Includes a 4 car attached garage, well for irrigation and solar panels. Neighborhoods: Rancho Palo Verde Complex Features: ,,,,,,,,,, Equipment: Garage Door Opener Other Fees: 0 Sewer: Septic Installed Topography: LL,GSL,SSLP"
"Expansive European Villa in prestigious gated Rancho Palo Verde, perfect for today s extended family. Wind your way through scenic trails, private lake & clubhouse. 5 BR PLUS bed/bath kitchenette suite for teens/grandparents & large, poolside office/gym suite ideal for working from home or working out. Relax in your master retreat with en-suite office, fireplace & steam shower! Most rooms open to the sunny deck with views of mountains, sunsets & stars. Well on property to save $. Solar owned & paid off. Neighborhoods: Rancho Palo Verde Equipment: Dryer,Garage Door Opener, Range/Oven, Washer Other Fees: 0 Sewer: Septic Installed Topography: GSL"
"Desirable Alpine estate in the beautiful Rancho Palo Verde gated community. So many amazing features in this home, large bedrooms, high end appliances, grand ceilings, travertine shower, etc. Property is perfect for those needing SPACE, great size front and back yard. If your desire is to have additional garage/storage space than this is the property for you! Private pool and built in deck spa. Balcony leading off the master suite overlooking majestic mountains. This property is 2 acres and all usable! Neighborhoods: Rancho Palo Verde Complex Features: ,,,,,,,, Equipment: Garage Door Opener,Pool/Spa/Equipment Other Fees: 0 Sewer: Septic Installed Topography: ,LL,,GSL"
"Grand, palatial estate perfect for the whole family. Located at the end of the street just steps away from the 250 acre Wright s field, enjoy unlimited access to trails and gorgeous sweeping mountain views. Ideal for entertaining, this home features an open style kitchen, vanishing edge pool with grotto, gazebo, and built in BBQ. Also featuring horse property and facilities, this home truly defines Alpine luxury. Come and enjoy living in the beautiful country side while still living in the city. Neighborhoods: Alpine Complex Features: ,, Equipment: Pool/Spa/Equipment, Shed(s) Other Fees: 0 Sewer: Septic Installed Topography: LL,GSL"
"Perched in the hills of Alpine and amongst eucalyptus and pine trees you ll find this gated estate. Once owned by an award winning classic car buff and builder, this spectacular home became known to some as the ' Killion Villa .This home boasts many custom features that include; 44 solar panels, solar heated pool, large gleaming lap pool, fire pit, intercom system, 4 spacious bedrooms, three and a half bathrooms, a bonus room / office. Second structure offers a potential granny flat. See Supp. Neighborhoods: Victoria Architectural Style: Monterey/Hacienda/Adobe View: Monterey/Hacienda/Adobe Equipment: Dryer,Fire Sprinklers,Garage Door Opener,Pool/Spa/Equipment, Range/Oven, Shed(s), Washer Other Fees: 0 Sewer: Septic Installed Topography: GSL"
"Presenting to you one of Alpine's finest equestrian estates. This amazing 3920 SF tri-level ranch style sitting on 5.5 acres is a highly upgraded home inside /out Features 5 bedrooms, 3.5 baths, gourmet kitchen with open floor plan that is an entertainers/chief's dream the master suite is located on the upper level with private balcony the amazing upgraded Resort style backyard paradise is a dream come true that seems worlds away but freeway close. A truly must see turnkey property that has it ALL. Neighborhoods: Alpine Architectural Style: Custom Built View: Custom Built Equipment: Garage Door Opener,Pool/Spa/Equipment, Range/Oven, Satellite Dish Other Fees: 240 Sewer: Septic Installed Topography: LL,"
"Welcome to McCall Ranch, a multi-generational horse property located in the coveted Viejas Grande Estates gated community. The property sits atop a hill on 2.85 acres with panoramic views of the surrounding mountains. The main house is a remodeled 3/2.5 with two attached casitas, each with its own bath. There's also a detached 2/2 guest house, and a huge barn with tack room and plenty of room for your horses or toys. To top it off, there's a large flat area for your arena, pool or parking for your toys. Neighborhoods: Alpine Equipment: Range/Oven Other Fees: 0 Sewer: Septic Installed"
"New Construction (under constr.) Custom Built! Views! Awesome floor plan on acre + corner lot, dual access. Concrete paver driveway. Spacious 4 BR w/ 4.5 BA. Every bedroom has a bathroom! Gourmet Kit. w/ lg island & walk in pantry. Expansive great rm opens to massive outdoor covered patio(42x15). Bonus rm for office. Master retreat w/ walk in closet. Tons of storage rms, closets & linens. 3 car gar (33x27) w/ 2 lg doors. Still time to pick out your finishes. Extra pad for granny flat, pool or workshop. Neighborhoods: Overland Passage Architectural Style: Custom Built View: Custom Built Equipment: Garage Door Opener Other Fees: 0 Sewer: Septic Installed Topography: LL"
"RARELY SEEN LISTING IN THIS HIGHLY DESIRABLE AREA!!! A TRUE MUST SEE!!!! LIVING IS EASY IN THIS IMPRESSIVE, GENEROUSLY SPACIOUS HOME WITH UNOBSTRUCTED PANORAMIC VIEWS OF THE SURROUNDING VISTAS AND VALLEYS. THE RESIDENCE RESTS ON 2.25 ACRES WHICH PROVIDES FOR AMPLE PRIVACY. THIS BEAUTIFUL RANCH STYLE HOME BOASTS AN OPEN, FLOWING FLOOR PLAN WHERE THE GOURMET KITCHEN OPENS TO THE DINING AREA AND GREAT ROOM. THE EXPANSIVE LIVING ROOM OPENS TO A SPACIOUS REAR PATIO WITH POOL AND INFINITY EDGED SPA AND BUILT IN BBQ AREA. IF YOU LIKE ENTERTAINING, WHETHER FOR LARGE OR SMALL GATHERINGS, YOU WILL LOVE WHAT THIS RESIDENCE HAS TO OFFER. THE ENTIRE HOME RECEIVES AMPLE NATURAL LIGHT AND ALL OF THE BEDROOMS ARE SPACIOUS AND WELL APPOINTED. GRANITE COUNTERS, AND FIREPLACES THROUGHOUT. SOLAR PANELS ARE INSTALLED AND PAID FOR. THE PROPERTY ALSO BOASTS A VERY LARGE DRIVEWAY LARGE ENOUGH TO ACCOMMODATE A MOTORHOME." "PRICED $899,900 TO $925,000. LARGE CUSTOM VIEW HOME ON OVER 4 ACRES AND THIS ONE IS LOADED, INCLUDING HUGE EAT IN KITCHEN WITH GRANITE COUNTERS, WOOD BEAMED CEILINGS, HUGE MASTER BEDROOM WITH WALK IN CLOSET, MASTER BATH WITH SOAKING TUB AND WALK IN SHOWER, GAME ROOM WITH BAR AREA, SPACIOUS LOFT THAT COULD BE THE 4TH BEDROOM, GORGEOUS POOL AND SPA WITH SWIM UP BAR AND BEACH ENTRY, 3 CAR GARAGE, TONS OF RV AND BOAT PARKING, LONG PRIVATE DRIVEWAY, THIS LOT HAS ENDLESS POSSIBILITIES. Neighborhoods: ALPINE Equipment: Garage Door Opener,Pool/Spa/Equipment, Range/Oven Other Fees: 0 Sewer: Septic Installed Topography: LL,GSL"
"$849,000- $899,000!! Large family? 2-3 families? Serene Estate ideally located at the end of a private road in the Palo Verde Ranch Community, yet free of HOA dues! Over 4600 sq ft of living space w/ 2 master bedrooms, oversized rooms, and 700 sq ft great room w/ full bath that opens up to the backyard/ pool- Great for entertaining! Almost 3 acres of well-manicured grounds with fruit trees, grape vines, mature Oak Trees, raised garden beds, pool and spa, and seasonal creek on the edge of the property. Neighborhoods: Palo Verde Ranch Equipment: Pool/Spa/Equipment, Shed(s) Other Fees: 0 Sewer: Septic Installed Topography: GSL"
"Hemp (non THC) is now a legal Ag crop!! An amazing 237 acres, with a move-in ready ranch house; Rare opportunity to create your dream compound! Perfect for orchards, vegetable gardens, livestock and much more. One producing well + one backup, includes 2 large water storage tanks. This single legal parcel is comprised of this APN and APN 523-150-10-00. Nature abounds throughout the property. This serene location only 45 minutes from San Diego airport. Neighborhoods: Japatul Valley Equipment: Range/Oven Other Fees: 0 Sewer: Septic Installed Topography: ,RSLP,GSL"
"Looking for a single story home but the lot size is too small? Look no more! Featuring a desirable single story floorplan with 4 bedrooms (one used as an office/den), 2.5 bathrooms, an open floorplan with views from every room on 1.17 acre. Views to the Coronado Bridge and Point Loma on clear evenings. Spacious living room with a fireplace and, if you like to entertain, you will love the dining room with room for a large table and buffet; and it includes built-in storage. Paid for solar. Keep reading! Neighborhoods: Alpine Other Fees: 120 Sewer: Septic Installed Topography: LL,GSL"
"Located in the desirable Palo Verde Ranch this Single Story home with an Arizona like setting featuring outdoor living at its finest with multiple patios for entertaining or to enjoy relaxing mountain views. Updated and move in ready with and open floor plan, solar that is owned and a well for both the house & irrigation. Palo Verde Ranch community includes a private lake for fishing, swimming, paddle boarding, kayaking, a boat dock, clubhouse, gym, bbq, picnic area, tennis courts, hiking & horse trails. 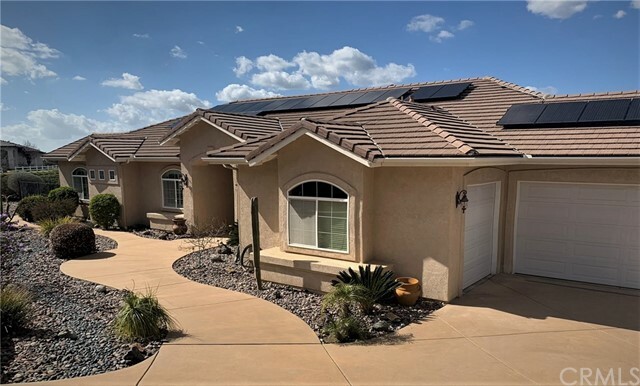 Neighborhoods: Palo Verde Ranch Complex Features: ,,,, Equipment: Garage Door Opener, Range/Oven, Vacuum/Central Other Fees: 0 Sewer: Septic Installed Topography: LL,GSL"
"Welcome to Alpine and look no further as you will enjoy the peaceful tranquil lifestyle while on top of the world. This single story home is move in ready, has an open floor plan and boast gorgeous panoramic mountain views where you can enjoy outdoor living underneath the covered patio entertaining or star gazing. Nicely landscaped and ready for you to have a vineyard right outside your door. With over 2 acres there is plenty of room for RV parking, all your desert toys and room for a pool. Neighborhoods: Alpine Ranch Estates Equipment: Range/Oven, Vacuum/Central Other Fees: 0 Sewer: Septic Installed Topography: LL"
"Stunning Custom Estate in Prestigious Overland Passage! Impressive Architecture with Superb Cathedral Ceilings, Dual Staircases & Hallway Balcony! Superior Materials, Steel Beam Construction, Huge Windows, Travertine Tile, Granite Countertops, Crown Molding ! Gourmet Kitchen with Center Island & Peninsula, New Stainless Steel Ovens, 3 Refrigerators & Chefs Range & Hood! Second-Floor Deck (1080 sqft not in listing), 4-Car Garage for Toys & RV Parking in Back! Expansive Views Too! Much More, See Supp! Neighborhoods: Overland Passage Architectural Style: Custom Built View: Custom Built Equipment: Garage Door Opener Other Fees: 0 Sewer: Septic Installed Topography: LL"
"Beautiful custom home nestled in the middle of 8.45 acres of land offers an open floor plan with lots of natural light. The home is private and has a gate. Upon entering the home you will be amazed by the dramatic vaulted ceiling in the living room and the spacious living areas as well as the large master bedroom retreat. Fresh exterior paint, new water tank and pumps and solar that will save you lots of money. You can enjoy the beautiful views from the wrap around deck. Come see this property! Neighborhoods: Alpine Equipment: Garage Door Opener Other Fees: 0 Sewer: Septic Installed Topography: LL,"
"Views are fantastic!! This 2 story home offers 5 spacious bedrooms and 3.5 bathrooms. Double doors open to the grand entryway & half spiral staircase. The kitchen has a massive Quartz slab center island with seating for 5-6 people, tons of cabinetry, a spacious eat-in area & walk-in pantry. Downstairs is a bedroom & bath plus another half bath for guests. The master bedroom & 3 other spacious bedrooms are upstairs as well as the loft. Pool, Spa & Gazebo! Major interior upgrades were completed in 2018! Neighborhoods: Sky Mesa Equipment: Garage Door Opener,Pool/Spa/Equipment, Shed(s) Other Fees: 0 Sewer: Septic Installed Topography: GSL"